History unveils a plethora of government boondoggles in decision making and expenditures. In most instances, the facts remain in place and the evidence fades away. 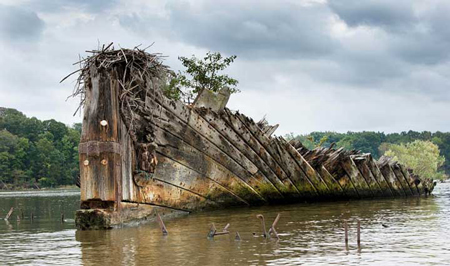 Such is not the case in Mallows Bay, Charles County, Maryland, where a decision made during WWI leaves to this day a vast graveyard of decomposing vessels that never saw a bit of service. Hailed as the “largest maritime graveyard in the Western Hemisphere,” it goes down in history as one of the government’s biggest blunders. It all began with good intentions, the United States simply trying to rescue its Allies and hasten the end of hostilities. It was called the Great War, a global conflict begun in Europe on July 28, 1914 and lasting until November 11, 1918. We joined Russia, France, England and other Allies on April 6, 1917, to battle Germany, Austria, Hungary and others that misjudged the power of a united front. German submarines were knocking out cargo ships faster than the Allies could build them. We jumped into the fray, our U.S. Shipping Commission creating the Emergency Fleet Corporation (EFC) to oversee the construction of one thousand cargo vessels. In order to free our shipyards for military construction, private contractors were hired to build prefabricated wooden, coal-fired steamships 240 to 300 feet long. From the outset, ineptitude ruled as the bureaucracy fought with the builders over funding, deadlines and the use of unseasoned wood. On December 1, 1917, eight months after the U.S. entered the war, the first EFC steamer was launched. But by the war’s end, less than a year later, only 87 wooden ships had been set afloat. That’s when the biggest boo-boo took place. With the approval of President Woodrow Wilson, the government allowed construction to continue on the now obsolete vessels. By the time the EFC disbanded, 296 had been launched, but transport fleets were no longer in demand. The glut of idled ships became the “Great Tie-up of 1920” and the inefficient wooden hulled ones were the first dispensed to mothballs. Two years later, after turning down low bids, the government accepted an offer of $750,000 for 226 vessels which had been built at a wartime construction cost of $300 million. The Western Marine & Salvage Company of Alexandria, Virginia, purchased the fleet with plans to move it from their anchorage in the James River near Claremont, Virginia, up the Potomac River to Alexandria. But moving, storing and demolition problems arose along with complaints from local watermen. 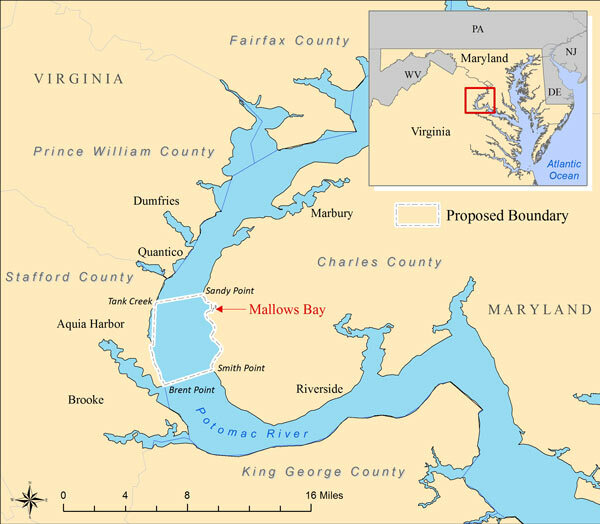 Avoiding a dispute, the company purchased 566 acres along Mallows Bay and moved its operation across the Potomac to Maryland shores. But times grew tough and prices on scrap metal dropped. When the company went under during the 1929 stock market crash, 169 EFC ships remained in the densely populated nautical graveyard. Squatters, bootleggers and prostitutes soon took up residence in the remaining hulks that hadn’t been set afire by hooligans and maverick salvors. Impromptu salvage by interlopers of metal and assorted jetsam continued until WWII when Bethlehem Steel Corporation of Baltimore, Maryland, made a vain attempt to salvage thousands of tons of scrap metal. Their cofferdams worked, but as the water was pumped out, the hulls sank into a mass of mud. 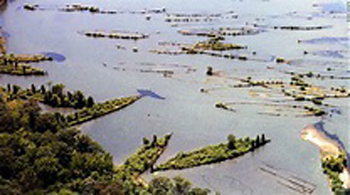 By 1944, all major salvage attempts ceased leaving a ghost fleet in Mallows Bay. In 1993, marine archaeologist Donald Shomette of Dunkirk, Maryland, headed the first effort to evaluate the fleet. He identified 88 of the original 154 wooden steamships purported to be there. He found other wrecks as well including a ferryboat, 12 barges, a Revolutionary War longboat, log canoes, schooners, a menhaden boat and several workboats. Further details of these and other interesting facts can be found in The Ghost Fleet of Mallows Bay by Donald Shomette. Charles County officials, fearing the thought of their wetlands being cast as a dumping ground, turned the whole image around. In conjunction with the Federal Bureau of Land Management and the Maryland Department of Natural Resources, the county purchased 5,000 acres and 10 miles of shoreline to establish one of the finest reserves in the Mid-Atlantic region. Recreational kayakers and canoeists from Maryland and surrounding states relish the interpretative trails that wind through the overgrown hulks. Wild life abounds as bald eagles, egrets, ospreys and song birds nest in the sprouting trees and feral shrubs. Fishing along the shore or from boats without motors adds more serenity to this obscure haven. Designated a National Marine Sanctuary by the National Oceanic & Atmospheric Administration (NOAA) in 2015, the 14-mile expanse is an ecological gem on the chain of attractions in Maryland’s tidewater country. Officials of the Free State took a government gaffe from yesteryear and turned it into a present-day project of pride and purpose. The irony is this time the government’s help has a positive spin to it which benefits countless outdoor enthusiasts. I enjoyed your Mallows Bay article. It’s quite informative. I had never heard of the bay, but now I can’t wait to visit it and kayak around the old wrecks. Oh good! I was hoping that viewers would read about Mallows Bay and then make plans for a visit. Good luck Have a great time! I liked reading about Mallows Bay. I didn’t know about it. My goodness, the government surely goofed in building all those ships. Your story aroused my interest to go there. I don’t live too far from Charles County. Would there be kayak rentals? I’m pleased you liked my article. Go to: http://www.charlescountyparks.com or call (301)932-3470 (Mon-Fri, 4 to 2:30 p.m.)for information. The Charles County Dept. of Recreation & Parks sponsors kayak tours on Sundays with a guide. They call it Kayak Tours of Mallows Bay Park. Please E. Boyd ….. First World War or the Great War, was a global war originating in Europe that lasted from 28 July 1914 to 11 November 1918. Can you change this date in your article , Please? I like your writing but this is too much. It is a fascinating trip into history and the re-establishment of mini-eco systems that developed around the ships. At low tide the hulls of some ship are very close to the surface. You have to pay attention. Threre is a kayak launch. Larry: Many thanks. That’s an interesting point about the eco systems. 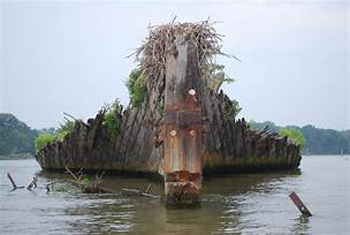 My wife and I plan to visit Mallows Bay in the spring. All information on it is welcome.